How much do you know about the biblical account of creation? 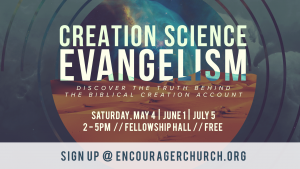 Join us for a free seminar on Creation Science as we uncover the truth behind the Bible’s narrative on this subject, and how you can use it to share the Gospel. This event is for all ages. Sign up by clicking the link.